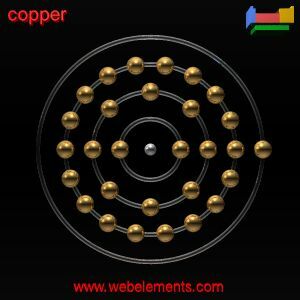 Position in the periodic table: Copper belongs to Group IB and period 4 of the periodic table. It is a 'd' block element. It is also known as transition element. Copper is a red brownish metal with a metallic luster. Its specific gravity is 8.95. It is highly malleable and ductile in nature. Its melting point is 1083°C and its boiling point is 2562°C. Reaction with hydrochloric acid Copper does not react with hydrochloric acid in normal condition but Copper react with the dilute hydrochloric acid in the presence of air to form cupric chloride. Copper reacts with the concentrated hydrochloric acid, and it forms cuprous chloride and hydrogen gas. Reaction with sulphuric acid: Copper does not react with the sulphuric acid in normal condition but Copper reacts with the warm dilute sulphuric acid in the presence of air to producecoppersulphate and water. Copper reacts with hot and concentrated sulphuric acid to produce copper II sulphate and sulphur dioxide. Reaction with nitric acid : Copper reacts with hot dilute nitric acid to form copper(II)nitrate,nitricoxide and water. Copper reacts with hot concentrated nitric acid to give copper nitrate, nitrogen dioxide and water. Copper is used for making electrical goods and cables. It is used in electroplating. It is used for making utensils, coins, jewelry, etc. It is used in the manufacture of dyes and pesticides. Copper belongs to Group IB and period 4 of the periodic table. It is a 'd' block element. It is also known as the transitional element. Copper is used for making electrical goods and cables, manufacture of dyes and pesticides, make utensils, coins, jewelry, etc. The properties of copper are: red brownish metal with a metallic luster, highly malleable and ductile in nature, Its melting point is 1083°C and its boiling point is 2562°C. State any two properties of copper that make it suitable for making pots and pans. The two properties of copper that makes pots and pans are: a. Copper is malleable and ductile. b. Copper is good conductor of heat. Give a balanced chemical equation for the reaction between copper and concentrated and hot dilute nitric acid. Copper reacts with hot dilute nitric acid to form copper nitrate,nitric oxide and water. Give the orbital electronic configuration of copper and iron. What are the uses of copper? Copper is used to make wires because it is maliable and ductile. Copper is also used in electroplating as it resist rusting. The molecular formula of silver is _______. Copper belongs to Group ______. Copper reacts with warm dilute sulphuric acid in the presence of air to produce ______. Which one is not the ore of copper? Copper reacts with dilute hydrochloric acid in the presence of air to form ______. The atomic number of copper is ______. 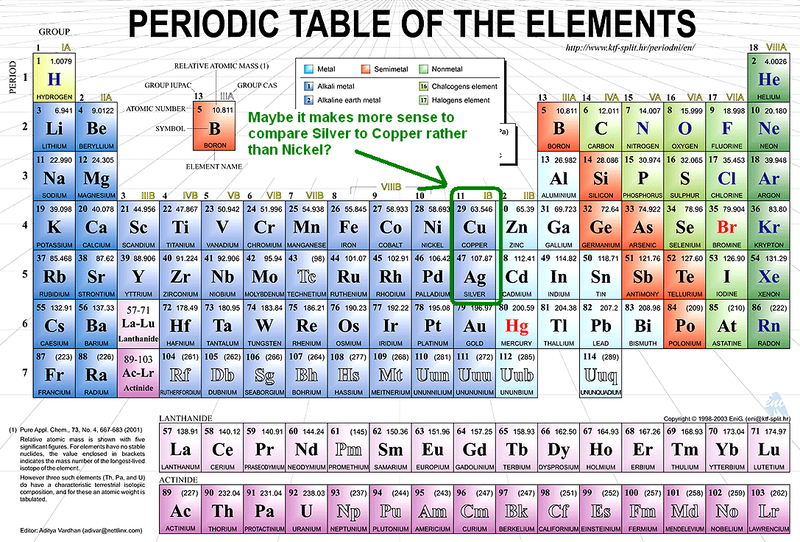 The correct electronic configuration of copper is ______. Any Questions on 'Copper '?